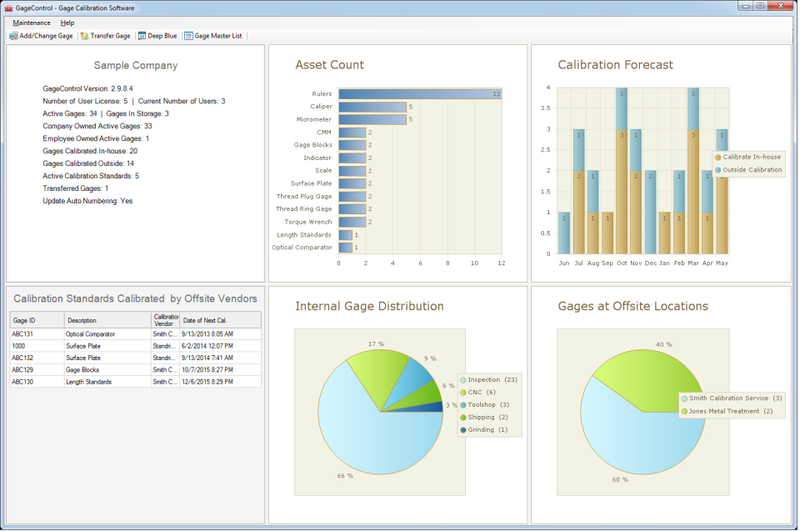 Gage Control Software Reviews Recently Reviewed! Excellent application for an AS9100C manufacturer of corporate aircraft like us. Highly recommended. Pros: We are an AS9100C Certified aerospace manufacturer of corporate aircraft. As such, calibration is critical to manufacturing at all levels. Our research revealed Gage Control Software provided the visibility, retention and alerts necessary. This product is an asset to our quality management system providing much needed insight and performance metrics to assure ISO and AS9100C. 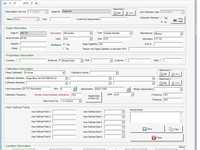 As we prepare migrate to the new AS9100D Certification we are pleased to learn that Gage Control Software is already compliant. The product is intuitive and easy to use but should the need arise, service and support is prompt and professional. The team at Gage Control Software is small but mighty. Overall: Increased our visibility. Improved our ability to plan. Reduced expedited re-calibrations. Most of all improved the overall quality of our process and reduced our risk of non-compliance. 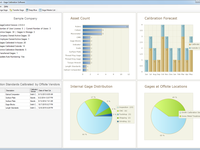 The dashboard provides the necessary metrics for AS9100C and AS9100D. Comments: My Company purchased Gage Control about 2 months ago and I have been the primary person to make all the inputs. 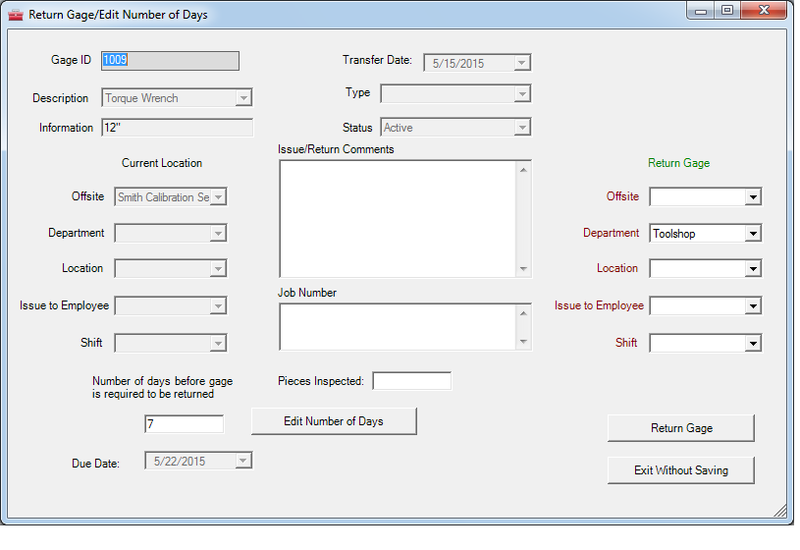 -You can put locations and personnel assignments on a piece of equipment if you choose to do so. -The additional feature indicating if equipment is onsite or off (and where), saves a lot of stress on trying to remember if we sent off a gage for calibration. -I enjoy the versatility of the program in that you can integrate things into the program like training, equipment, audit requirements and still keep the vastly different items separate and organized. -This program is very user friendly. When I train other personnel how to use it, they are good for use after 20-30 minutes of training. I get very few "how to questions" afterward. I can say, "this is the easiest program my Company operates". 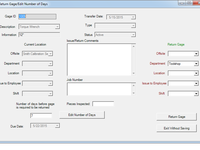 -The "best feature" of all is when creating a report, I can make a list and tailor it to show only the information I need. Then I have additional sort options like, "sort by date". This is very useful. -This is very minor. The program will not automatically change a status after an expiration date. For example if you have a piece of equipment that expires on the first of the Month, and it's status is "active", the program won't change that to "expired" on the second of the Month. You have to do that manually. For some Companies that is good because you don't want a program automatically expiring equipment that may have a grace period. For Companies with like mine with aviation standards this is very minor because you have to go by the date every single time on every single piece of equipment. I am pleased with the function and utility of the program. It does the job we desired it to do. I would recommend this to any Company desiring to track equipment and events with time based requirements. Pros: simple to use and set up can quickly find our equipment and keep it in calibration. Great reports also for audits. Cons: Just a glitch when we set up so every now and then the system wont let me log in telling me we are over our user limit. I think this was a mistake on our part when we set up. Overall: simple, easy and fulfills the needs we have . Comments: Gage Control software is easy to install, easy to learn and easy to use. I looked at several calibration software options and Gage Control has the most/best functionality and at the same time is very reasonably priced. 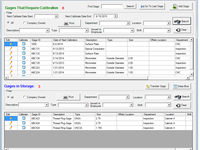 Among its features, it has the capability to store scanned and emailed calibration certificates from outside calibration suppliers. Reports can be emailed directly from Gage Control and gage status is easy to see at the touch of the keyboard. I am not very computer literate, so i did not want calibration software that was going to be difficult to use. Also, I look at software as a tool that should work for me- I will not work for it. If software does not save me time and make work easier, I have no use for it. I have much more important things to do than figure out how to use cryptic software that was written by knuckleheads. Gage Control exceeded my expectations in price, functionality, ease of use and response to questions as I was learning to use it and when it was being installed. The web based training provided was excellent and I was up and running after about 1 hour. The product support is the best. I highly recommend Gage Control. It is truly great calibration software. Comments: Pros: After the on-line tutorial, this software is truly very easy to use. It can track company gages, employee gages, company gages issued to employees, in-house, off-site and gages that you may have in storage that are not in-use at the present time. You can attach pictures of the gages for easy search and calibrate. 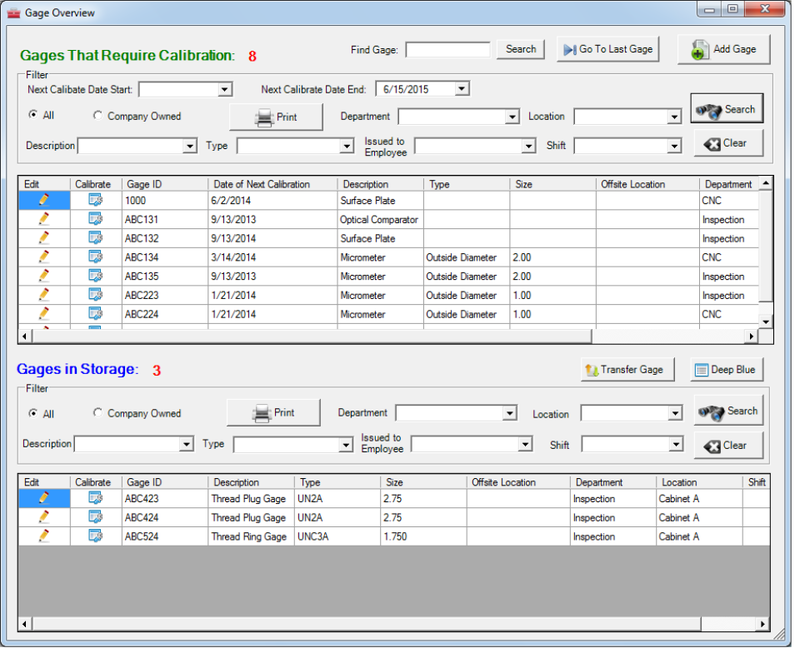 Attach scanned copies of certifications from purchased gages or outside calibrations. It will even notify you by email or mobile phone when gages are coming due for calibration. We purchased software for one user. So only I can log-in, add and make changes. But anyone, for example our design engineer, can go to the Gage Control login screen, on their computer, and click on Deep Blue. That gives read only access to see all of the gages we have in the system. To make sure we have a particular gage for a new job. Overall: I have used a few different brands of calibration software in the past. I first planned on getting the brand used at my previous job, until I saw how much it cost. So I decided to shop around and found Gage Control. The software is top notch and their customer service is excellent! Cons: Nothing, really, one just has to get to know the correct tabs to use for specific calibration assets for entering dates and measurements. Overall: The support for installation could not have been better. For the basic use of the software, I like to figure things out for myself before I have to call for help and I was able to do that, it was so easy. Pros: Like they say, it does it all for us. We have to control 3000+ gages that have to be managed between two company manufacturing entities, employee gages, gages that are sent out with our products for outside processing, and for use in our in-house testing laboratory. This software makes managing that much easier and the customer service is top notch when needed. Very good reporting aspects as well. 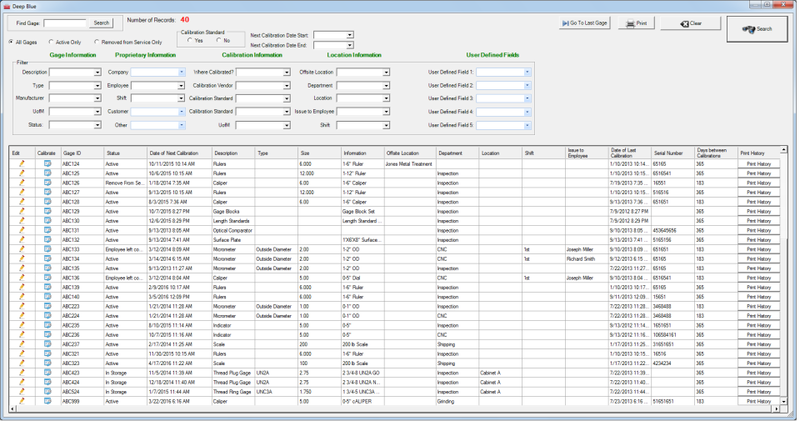 All customer audits go very well when showing them this software system, they are impressed. Cons: After using other software there are really no cons with this software. Overall: Any company with the need to control their gages such as we do really need to look into getting this software...even small manufacturing companies can benifit with it as they grow as the software is there to handle any and all expanded needs of the company. Pros: Ease of use, great support and training. Overall: I am very happy with the Gage control software and its ease of use. This is a very good program and I would recommend it to anyone. If you ever need a reference for the program, I would be happy to recommend it. Recommendations to other buyers: I have been in Quality for 30+ years and have used several different gage software programs, but this program is the best and the support is great. Not user friendly. Staff resistant to changes when needed. Pros: Gage Master List is a good layout, but cannot make customization as needed. The customization is minimal, unfortunately. 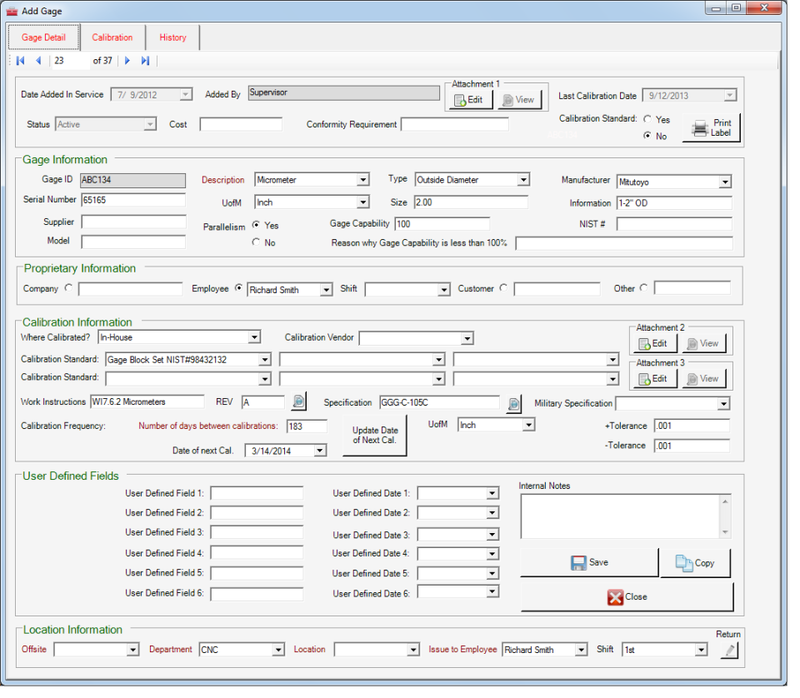 Previously used other gage software that would put this one to shame - and not much more expensive. Cons: Can not make changes when needed - not enough admin. Support not patient with new users. Software - for the most part - not as advertised. Pros: The ease of use and navigating through the software is very simple. Cons: I have nothing to say here. Overall: The software is working out great! This has been a huge help to us here at Future Test. Thank you again and I look forward to our continued use of Gage Control. Pros: The basics of the software are very easy to pick up, and the support team is always very helpful for some of the more advanced options. Thanks for checking back in! The label maker has been working great. Thanks for always being so helpful when we are having trouble. Comments: As far as Gage calibration software goes this has been the easiest program to learn that I have used in the past 20 plus years. Like I said before your team did a very good job in developing this program. I would highly recommend this software to anyone who needs to keep track of their gages both in-house and outside. Comments: I have been very impressed with Gage Control Software. 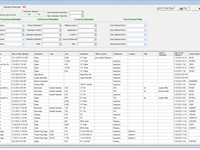 It is very easy to use, but also complex enough to service my company requirements. Customer service is the best I have ever dealt with. If I have a question or problem, it is solved within 2 hours max. I highly recommend this software! Comments: Easy to use, easy to install, easy to input, easy to maintain. Gives us all the features we needed to take control of our inspection gages in order to comply with Aerospace standards. Everything is there. Links to standards, procedures, and certifications. Highly recommend! Excellent software at an even better price! Comments: Our company is in the process of getting our ISO 9001:2015 registration and I purchased Gage Control Software to automate our gage calibration system. This software can provide for all of my needs and a whole lot more. Highly recommended. Comments: Great software, easy to use, training was fantastic. They transfered our data from our old calibration system to the new sofeware and we were able to make the the transition effortlessly. Would definitely recommend this software. Pros: Absolute everything located in one place. Nothing to hunt down when you're trying to do your job, and nothing to hunt down when you're being audited. Overall: Being able to meet the industries highest rating, is to be AS9100 compliant. Overall: The customer service, quick quote, a wonderful training available. I contacted three different software companies and selected this company. Recommendations to other buyers: Keep up the fantastic your team is doing. Now days is hard to find a company dedicated to provide good customer service.